Mick is an alumnus of Benson High School and the University of Nebraska at Omaha. He served in the US Army during the Vietnam era and was stationed on Nike Hercules Missile units in South Florida and Germany during his service. Mick retired from a 43-year Banking career last July 2018 spending 14 years in Lincoln, Nebraska as a commercial banker and the past 10 years as the Market President of US Bank in Council Bluffs, Iowa. He recently took a part time position with Clear Title and Abstract, a Title Insurance Company doing public relations and Marketing work. Mick joined Rotary in 1996 as a member of the Lincoln #14 Rotary Club. He served as several committee chairs and as a Board member and co-chaired their community Service Auction before he was transferred to Council Bluffs. He joined the Council Bluffs Noon Rotary Club in 2009 and has served as a board member and Club President in 2012-2013. He is a graduate of the Rotary Leadership Institute and has served as Global Grants chair and as an Assistant Governor for 4 years at the District level. He is a Multiple Paul Harris Fellow, Foundation Benefactor and Bequest Society Member. Mick has been happily married to his wife Jan for 34 years and they have 4 children and 11 grandchildren. Mick will tell you as a past president of a Kiwanis Club, there is no service organization on the face of the earth as great as Rotary. Rotary provides you opportunities to grow both personally and professionally that no other organization can. 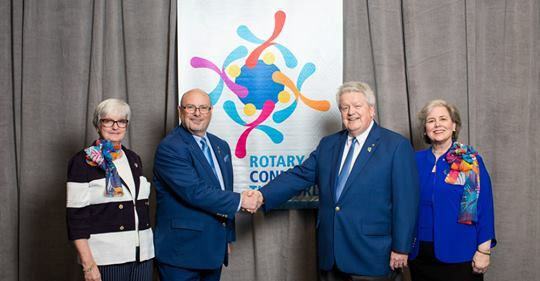 He is proud to be a Rotarian and to lead the District in 2019-2020 as your District Governor.